Portrayed as one of the most romantic cities in the world, Paris holds much magic for many couples around the world. And what’s not to love about Paris, with its famed Eiffel Tower, the refined French culture, bright lights and the pedestrian Pont des Arts, a cruise on the Seine River, as well as the cafes dotting the equally famous Champs Elysées avenue. In the Philippines, there is also a city famed for its romanticism: the City of Iloilo, which is also known as the City of Love. And it was rightfully known so, given the welcoming warmth and the genuinely gentle demeanor of its people, as well as the enchanting beauty and mystery that this city offers. One developer smitten by the quaint charm and best kept treasures held by Iloilo would be property developer Megaworld Corp., which is bent to allow more people to experience the love and romance that the province shares with Paris’ very own historical street, Rue Saint-Honore. Through the sixth residential tower that Megaworld is building within the 72-hectare Iloilo Business Park, this prime real estate firm is set to pay homage to that historical Parisian street by enabling more Filipinos experience the same vibe and grandeur offered by the Rue Saint-Honore. The 10-storey Saint Honore condominium will be an exclusive residential community inspired by the classic architectural designs of the shophouses, boutiques, museums and retail rows of the Rue Saint-Honore. “Ilonggos will get to experience the world-renowned beauty of Paris with Saint Honore. 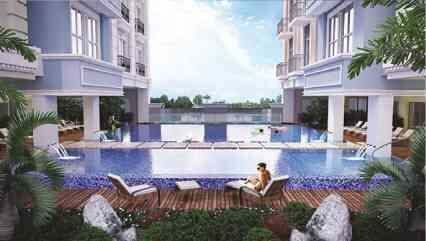 Amid all of its grandeur and Parisian lifestyle, future residents are assured of utmost exclusivity, privacy, and serene atmosphere in this first-of-its-kind residential enclave in Iloilo,” said Megaworld’s Iloilo Business Park Vice President for Sales and Marketing Jennifer Palmares-Fong. Patterned after the classic elegance Paris is known for, Saint Honore evoke a striking and elegant façade, that is set to emanate the timeless luxury in the City of Love. With only 168 units ranging from studio to executive 2-bedrooms, future residents are guaranteed of outmost privacy and convenience while indulging in the famed French grandeur. And adding up to the romance and classiness of Saint Honore would be the select units which will have its own lanai or balcony that would give residents a magnificent view of the township or Iloilo skyline. Meanwhile, to further capture that authentic laid-back, laissez-faire way of the Parisian life, Saint Honore will have its own lifestyle amenity deck on the third floor complete with a swimming pool, a pool lounge, a kiddie pool, a Jacuzzi, function halls, and a fitness center. “Saint Honore will be a short walk distance to and from Richmonde Hotel, Marriott Courtyard Hotel, the Iloilo Convention Center and the Festive Walk Mall. Walkability around the township is a key selling point of this development,” she explained. Poised to be the biggest business and tourism hub in Western Visayas, Iloilo Business Park is a vibrant integrated urban township of Megaworld where everything is within easy reach. The completion of the entire development is expected to provide Ilonggos a rare brand of luxury that only Megaworld can bring. Meanwhile, apart from Saint Honore, the Iloilo Business Park will also feature various residential towers that will likewise allow Ilonggos to experience the thrill of living at the center of the township’s action and vibrancy. Other residential developments include the 22-storey The Palladium, the Lafayette Park Square which mirrored the province’s rich culture through the developments combined French and Spanish architectural elements, and One Madison, where luxury living comes almost naturally.